New Trinity Baroque ownes several historical instruments (mostly copies of historical originals from the 17th and 18th centuries), including a baroque violin, three historical bows (two for violin & one for 'cello), a single-manual harpsichord based on the 17th century instrument by Andreas Ruckers, a chamber (continuo) organ suitable for music from Renaissance to Classical times, and several modern keyboard and string instruments. 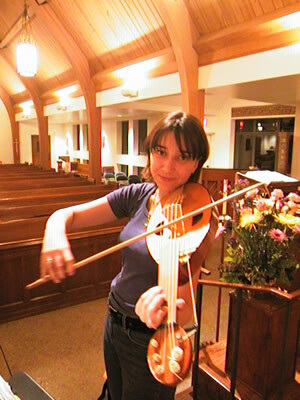 New Trinity Baroque is happy to loan them to other early music ensembles and soloists. Please inquire about instrument types, availability and pricing. You can get further information about some of these instruments at "our instruments" page. Also, thanks to the networking with other ensembles, we might be able to help you obtain an even bigger selection of Baroque instruments, as well as some Renaissance and Medieval instruments (vielle, hurdy-gurdy, etc.). Feel free to contact us and ask any questions. For telephone, fax, E-mail or snail mail address, please visit our contact page.